Throttle and Calibration (HELEN SCARSDALE AGENCY HMS040) is the latest tape release from Jim Haynes, presented here as a beast of eight tracks…an earlier release of same did surface on Crónica but was slightly truncated. The brutal and noisy sound-art on offer here was the result of a collaborative exercise co-ordinated to some extent by Simon Whetham, himself no stranger to getting out in the open and delving his hands into the throbbing heart of the unknown. In this case the unexplored territory was somewhere in Estonia, near a village in Mooste, where numerous artists were invited for residency, Jim Haynes among them. They were invited to document the surroundings in any way possible, just as long as it ended up in a form which could be played back as sound…and the landscape offered no end of fruitful avenues for investigation, mostly abandoned vehicles and non-functioning machinery left in the wake of post-Soviet industrialisation of this area. As you know phonographers are just drawn to this kind of desolation and they like anything metal and lonely that’s sitting in the middle of a field with no-one to tend to it. All the above was bundled together under the name of the “Active Crossover Series”, a woolly phrase which doesn’t exactly fill me with inspiration, nor does the revelation that the artists shared their work with each other in the name of further “cross-pollination”. 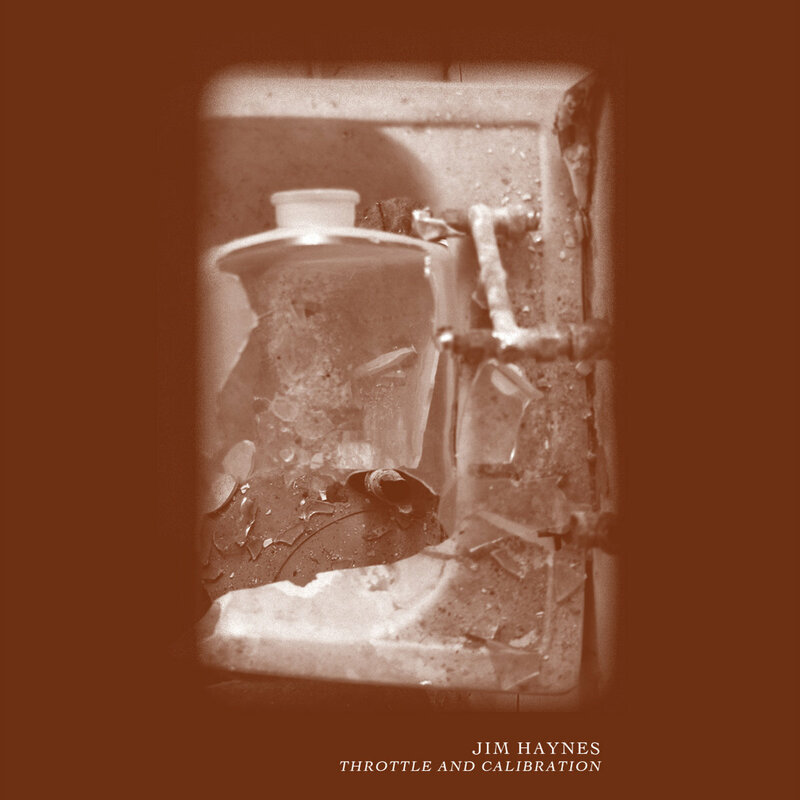 1 However, the collaborative dimension seems to have suited Jim Haynes well, and he shoved his snout freely into the trough of shared materials to come up with the sounds we hear on Throttle and Calibration. I particularly like the idea that he was “grotesquely exaggerating the details”, to use his own expression, which I suppose points to a process where even the briefest moment of a sound event stands a chance of becoming the basis for a symphony of industrial noise. Other elements which played a part in the composition were “dissonance, metal and short-wave radio signals”, all of these now near-standard features of contemporary compositions of this ilk that are grounded in field recordings and environmental explorations. Me, I’m just happy when Haynes gets down and dirty with some heavy blastage, like he did to some extent with 2015’s Scarlet. He acknowledges a debt to Hermann Nitsch (the abominable Aktionist with his blood-filled atrocities) and to the pseudo-surrealist alienation techniques of Nurse With Wound. A large number of contributors supplied the raw materials as part of the Crossover thing, among them Eamon Sprod, John Grzinich, and Whetham himself. It’s not all teeth-grinding ear-shattering industrial whine, however, as the more reflective and melancholic workouts such as ‘From The Sun’s Limbs’ will testify. Haynes continues to impress as a serious creator with a genuine sense of curiosity guiding his every move, and there’s a thread of aesthetic contemplation that links all of his releases. From 31st January 2017. But I just wanted to make a small comment in regards to your footnote. I understand your misgivings regarding the often trite and unsubstantiated claims made by sound artists/musicians using field recording. I think they are very well founded. However in this case we did not make such a claim (unless I am very much mistaken). We simply collected an “archive” of audio recordings, images objects and writing which resulted from our activities while participating in the Active Crossover residency at MokS. Initially this was conceived purely as a form of communication between the ever changing line up of participating artists, and was simply the amassed material generated from our collective activities. We made little or no attempt to “document” or “archive” the site or situation. If anything the central idea was to explore how people could work collectively in such settings (both Mooste itself and within a residency), not documentation. This archive was shared with all participants to do with as they pleased. Other than Jim’s release reviewed here there have been a number of other works generated from this collection of material, each employing quite different aesthetics, ideas and approaches.